What are calculators good for, really? A couple of years ago your Maths Masters were invited to speak at a teachers' conference, with the request that our presentation be light-hearted. We accepted, submitted our title Theorems by Theatre, and promptly forgot all about it. Finally, the day before the conference, we met to figure out what we would actually do. We tossed around various ideas, none of which could possibly be implemented in the few hours we'd left ourselves. Then one of us came up with a brilliant, talk-saving suggestion: "Let's just destroy a bunch of calculators". And that is what we did: we dunked calculators in buckets of water, to test Archimedes' principle; we threw calculators Frisbee-style into a fan, to see if a "discus" travels farther into the wind; we sawed slots into calculators and built icosahedra; and on and on. Our presentation was very well received. But why all this hostility towards calculators? It is not that we're anti-technology. Indeed, we're both welded to our laptops, and we're constantly using mathematical programming and computer-based mathematical exploration. 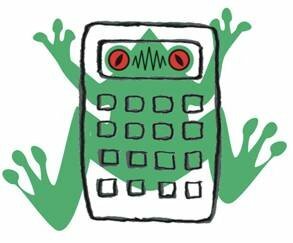 So why, when others talk of calculators, do we think of cane toads? The first reason is that the overwhelming majority of technology-based exercises are plain dumb. They do not reflect any real insight into what technology can, and cannot, do for you; they simply supplant thinking with button pushing. There is more that can be said here, and one probably wants to employ paper and scissors, to play with real live triangles. But what can ICT possibly contribute, other than to keep declaring that the equation is true for specific triangles? That is boring and pointless. Our second reason for hating calculators is that, whatever the ideals behind good technology-based exercises, we believe that the use of technology in schools rarely reflects such ideals. Our evidence is the many students we deal with who are dependent upon calculators to the extent of not having fundamental, essential knowledge at their fingertips. Every day we see the mathematical equivalent of students using a dictionary to spell "cat". More telling, the students are not the slightest bit embarrassed to do so. Here are a few examples: calculate 10% of 100; find 85 - 13; find sin(0); solve x2 - 1 = 0. You wish to object that no maths student would use a calculator or software for such problems? You'd be wrong. We did not make these examples up, and we see similar sins committed every day. With purported experts campaigning for ever more technology at every half-opportunity, such endemic misuse is inevitable. And now the draft national curriculum proposes technology at every turn, beginning with calculators as a way to introduce addition to prep students. Our response to that proposal is unprintable. We have one more reason for hating calculators and their kin. We acknowledge that there is a justified concern that teachers be trained in the appropriate uses of technology. But, whatever its intrinsic merits, this incessant technology push is hugely distracting from a much more compelling issue. Our prior and infinitely greater concern is that teachers be trained in what mathematics really is, and what it means to think mathematically. And here, most Australian universities are failing dismally, notwithstanding that the "world class" Go8 universities are attempting to shift much of the blame for the sorry state of mathematics education. We do not believe that either education faculties or mathematics departments are currently providing anything close to quality mathematical teacher training. Given this, we just cannot care whether teachers know how to use the latest Techno DoodleBoard. For all that, is there any place for computers and ICT in school mathematics instruction? Absolutely. There are fun computer games and computer activities, that are simply fantastic for engaging kids and getting them to practise basic mathematical skills. Maths Master Burkard made extensive use of such games when teaching Lara her times tables. ICT can also be used to illustrate difficult concepts, and to avoid painful and mundane calculations. Moreover, ICT can be a great exploratory tool. But such applications should be used thoughtfully and sparingly, and they should come after students have learned how to think mathematically, after the concepts have been introduced and understood. It simply makes no sense to have omnipresent ICT, to have a technological oracle constantly declaring upon mathematical concepts. To do so is not mathematics; it is religion. Feel free to suggest solutions in the comments section. Later in the week we'll post our solution. Please also email us if you wish to be added to our email list. 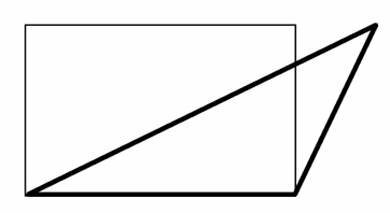 Our area argument above does not work for the triangle below, where the top corner of the triangle sticks outs, beyond its base. 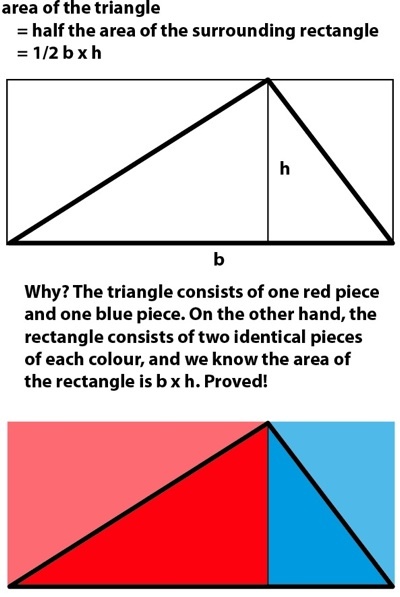 Can you see how to adjust the argument for such a triangle?